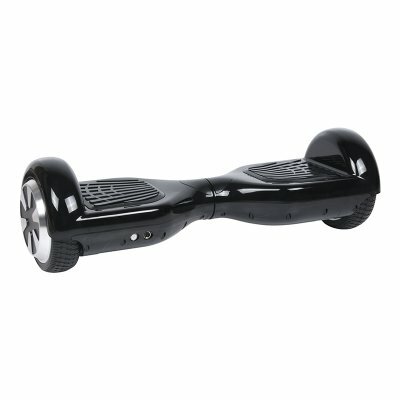 Successfully Added Self Balancing Electric Scooter MegaWheels - US + EU Only, Free Shipping, 2x350W Motor, 12KM/h, 20KM Range, UL2272 Cert (Black) to your Shopping Cart. Twin 350 Watt motors deliver speeds up to 12km/h for a safe and enjoyable ride. Meets full US safety standards and awarded UL2272 electrical safety certificate. Available in the US and many EU countries with free shipping the TW01S dual wheel electric skateboard is a fantastic and effortless way to travel. MegaWheels only uses the premium components and batteries and this electric skateboard has been given the UL2272 electrical safety certificate so there are no fire or safety hazards. Twin 350 Watt motors deliver a powerful and stable ride allowing you to cruise along at up to 12km/h without breaking a sweat and can even tackle considerable inclines of up to 25 degrees so you don't have to get off and carry it should you encounter a hill. With pressure sensors that sit under each foot, this electric vehicle is exceptionally easy to control and you don't even need much balance as the build in gyroscopic motors ensure you're kept upright with minimum effort. Having a maximum load capacity of 120kg it will zip you around town or even the office with total ease. The built-in 4400mAh lithium-ion battery delivers a range of about 20km so you can avoid the traffic and the road chaos of your daily commute and zip along in style on the MegaWheels dual wheel electric skateboard. The TW01S MegaWheels dual wheel self-balancing scooter comes with 12 months warranty, brought to you by the leader in electronic devices as well as wholesale electric rideable and compact personal electronic vehicles.. This item is stocked in Germany and can only be shipped to United Kingdom (EU power adapter, No UK adapter provided), France, Spain, Italy, Austria, Netherlands, Belgium, Luxemburg, Poland. Orders to other countries will not be processed. We offer UPS free shipping service in the United States and DPD free shipping service for many EU countries but will charge a small amount of operating costs, which you can see on checkout page. The orders should be delivered in 3 to 15 days, holidays excluded. Remote area: Alaska, Hawaii, Guam, Puerto Rico, American Samoa, Northern Mariana Islands, Virgin Islands, Federal States of Micronesia, Marshall Island, Palau(except Canada), Armed Forces Americas, Armed Forces Pacific, Armed Forces Europe. For orders to unlisted EU Countries and Regions please contact our Customer Service Department and we can process the order manually after confirming shipping options.